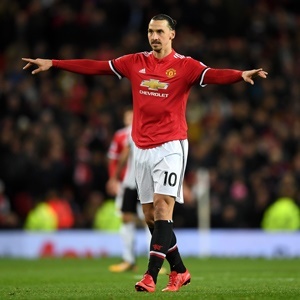 Manchester - Zlatan Ibrahimovic is in contention to make his first Manchester United start in seven months this Saturday after completing his comeback from a career-threatening knee injury. The striker enjoyed an impressive first season at Old Trafford following his free transfer from Paris Saint-Germain in July 2016, only for it to be cut short by cruciate knee ligament damage sustained in a Europa League quarter-final victory over Anderlecht in April. Both Ibrahimovic and defender Marcos Rojo, who suffered a similar injury in the same match, have now fully recovered from their injuries and could play a key role as United host Brighton in the Premier League this weekend. Former Sweden international Ibrahimovic, 36, has appeared as a substitute in each of United's past two matches, coming on as Newcastle were beaten 4-1 at Old Trafford last Saturday, and again on Wednesday in a 1-0 Champions League defeat by Basel in Switzerland. Rojo made his comeback by featuring at centre-back against Basel and is likely to be asked to play there again on Saturday as Phil Jones has a thigh injury and fellow defender Eric Bailly is struggling to recover from a knock. "I think Marcos could have been playing a couple of weeks ago," said United manager Mourinho. "We didn't need to rush him, push him into that situation, but he has been training with the team for quite a long time. "We need him with no Jones. We need Marcos back to give us the stability." Despite those defensive concerns, Mourinho is close to having a full-strength squad for the first time in months, with Paul Pogba feeling his way back to full fitness following a serious hamstring problem. The France midfielder scored on his comeback against Newcastle after two months out of action, but faded after a good start against Basel. With a glut of fixtures coming up, Mourinho made seven changes to his starting line-up in Switzerland, with only Pogba, Anthony Martial, Chris Smalling and Romelu Lukaku remaining from the team that started against Newcastle. More changes are certain this weekend as the manager attempts to keep his players fresh. Brighton manager Chris Hughton is expecting the United side to be rejigged and is not ruling out Mourinho's men for the title, even though they are eight points adrift of Manchester City. "Without being detrimental to the other teams in the top six, most people see the two Manchester teams as the strongest," he said. "Both have recruited very well and have big star players. "Ibrahimovic and certainly Pogba are a massive boost for them to have back at this stage of the season. They are both big teams and are showing that." The Seagulls are unbeaten in five matches and Hughton wants his players to show self-belief. "You can't go there with fear because if you do, it is inevitable what will happen," he said. "You have to go there with a belief and a confidence that you can get something."